One of the busiest actors of Kollywood, Suriya, son of yesteryear actor Siva Kumar is gearing up for the release of two of his much anticipated films of the year NGK under the directorial of Selvaraghavan and Kaappaan under the directorial of KV Anand. Having two much expected films on his pipeline waiting for a back to back release has made the actor’s fans very happy who have been waiting for a long time now to witness a block buster film from the actor. Amidst high expectations the teaser of Kaappaan hit the internet yesterday. The teaser was packed with class and was high on action. We have no doubt that people are going to have an amazing experience when they get themselves to the theaters this summer. The actor has performed some bizarre stunt sequences. There are a lot of intense moments in the teaser and the dashing hero is definitely making his presence felt with various makeovers. The different makeovers indicate that the actor might be garnering them for his undercover missions as the actor plays a NSG Commando officer in the flick. The female lead actress Sayyeshaa is convinced that the actor is a terrorist and spies on him on his missions and keeps reporting everything to actor Samuthirakani. In the teaser there is a scene where Arya proposes to Sayyeshaa, this leaves us puzzled over whose pair is Sayyeshaa. Director KV Anand is quite known for taking up social issues and deal with them in his films. We had witnessed them in KO and Kavan. 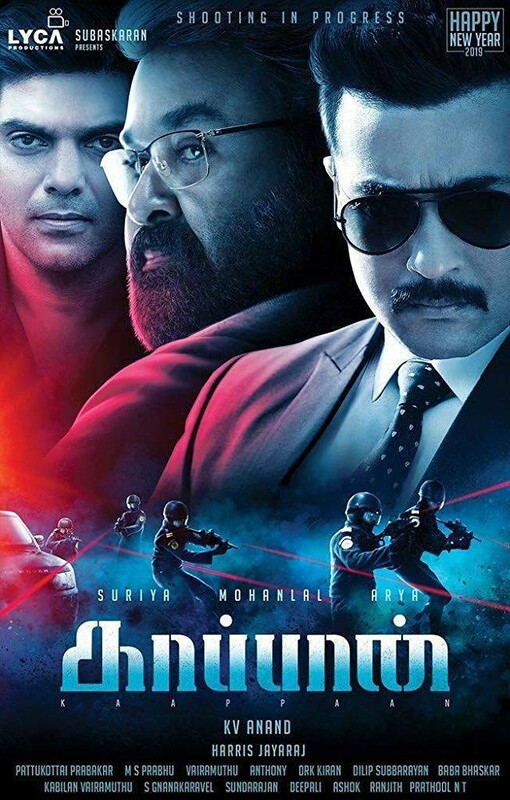 Even Kaappaan reflects to be one of those, as from the teaser it appears that he has once again chose to take an on-going issue and deal with it in his film. We could witness farmers being attacked while they are on their hunger strike and their lands being destroyed by wicked forces. Malayalam legend actor Mohanlal becomes India’s Prime Minister for this film while actor Arya is donning the role of Mohanlal’s son. With some powerful political dialogues delivered in a charismatic style of the actor, Mohanlal seems to force the attention of the audience towards him in the teaser. Even before the release of the movie actor Suriya’s fans has made a clear statement that this film is going to be a massive hit. The teaser of the film was also launched in Rohini Silver Screens in Chennai. The screen which has become a theatre for celebrations and launch of teasers and trailers recently witness thousands of fans gathering to celebrate the launch of Kaapaan’s teaser. Art director of the film Kiran and 2D Entertainment’s producer Rajsekar Pandian brought themselves to the venue to be part of the celebration. Group of traffic police had to intervene to clear the traffic caused by the teaser launch. The music for the film is composed by Harris Jayaraj who has intensified the action scenes with his background scores. The film that is bankrolled by Lyca productions is set to hit the screens on 10th of August 2019.